On a raiding voyage to Scotland, Thorfinn and his friends are kidnapped by Ranald MacRanald, chieftain of the Clan MacRanald, and imprisoned at his crumbling fortress, Castle Mad Dog. 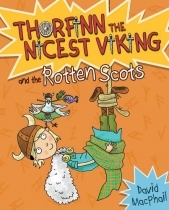 Ranald tries to ransom the 'fierce Vikings' but little does he know that his methods of 'torture' (making the Nicest Viking sew with women and clean the castle from top to bottom) are actually Thorfinn's idea of a brilliant Scottish holiday! Will Chief Harald the Skull-Splitter come to his son's 'rescue' before Thorfinn drives the Rotten Scots crazy with politeness?